"I was shocked. I was bleeding out of my nose," Leor Domatov said. "The guy was showing me different products of the vaporizers. He connected one of the vaporizers to the battery at the store," he said. "When he gave it to me to hold, it exploded in my hands and my face." "My left eye, I can't see anything right now cause I got a cut through my cornea, and in my right eye I have a little bit of vision," he said. At first, Domatov wasn't sure what had happened. Then he realized he was bleeding. "I see like red stuff on the floor, and I'm like, 'Oh my God, is this blood?' So I start crying, why does it hurt me in my hands?" he said. Domatov's attorney Marc Freund intends to sue both the shopping center and the kiosk. "They don't ask him for any ID, nothing, and they're showing different types of products. There are no signs up that reflect the New York state and city law. It's illegal to sell these products to anyone under the age of 21," he said. The kiosk now has a sign posted that reads, "Must be 21 to purchase any product, we ID all." 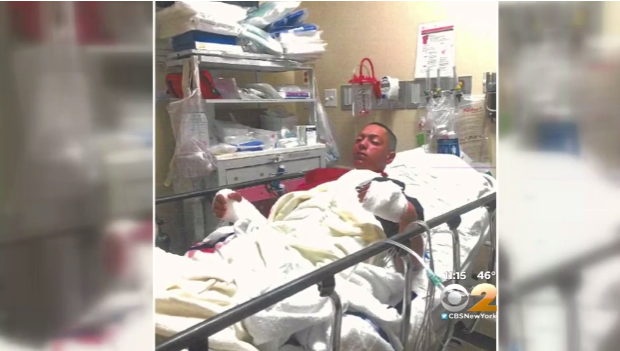 This isn't the first report of e-cigarettes malfunctioning and injuring people.